Welcome to LoveKnitting’s festive Knit-A-Long! We’re kicking things off with an introduction to everything you’ll need. Let Jenni talk you through the required materials, the pattern sizes and tensions…. I’d like to begin with a big thank you to the hundreds of you who have signed up to our first ever Knit-A-Long and for being so patient whilst we were preparing the materials for you. To say I am excited is an understatement, I can’t wait to get knitting! Read on to find out which sizes are available, the gauge of the pattern and of course, the materials you need to get started. Scroll down to see all the materials you need with a fantastic 10% off! We’ve put together a collection of yarns you can use for the this pattern with the same weight and tension. Take a look at the table below to see how many balls of yarns you’ll need for for each shade with 50g balls (112m). Monica, the designer of this lovely set, used King Cole, Merino Blend DK to knit her jumper and hat. It’s a soft, 100% pure wool yarn that’s ideal for keeping your little ones warm and comfortable. It also happens to be a dream to knit with and to top it off, it’s a superwash wool, so no worries about popping it into the washing machine when those inevitable spillages happen over the Christmas dinner table! It is knit in two different shades, Scarlet (009) and White (001). I want something really special as a treat for a 2 month year old this Christmas and so I have decided to knit with an extra special yarn. I’m knitting with Sublime Extra Fine Merino DK a truly lovely 100% merino wool yarn that is just so soft to touch! It’s a very versatile yarn with excellent stitch definition, plus, it’s also machine washable. You’ll need 3 (3: 4: 4) balls of Red Hot (167) and 1 ball of Alabaster (003). Sirdar Snuggly DK is ideal for baby clothes as it is washable, non-irritant and easy to work with. Try shades Engine Red (413) or Flamenco (242) and White (251). Debbie Bliss Blue Faced Leicester DK is an 100% British wool yarn – a great option for those that want to knit British and make it a little bit more special. We love the idea of changing up the colourway and knitting it in this gorgeous Pale Blue (013) and Ecru (001). But if you still want to go for red, you’ll want it in Crimson (010). Wendy Merino DK is a great value yarn which uses only the Merino sheep breed known for its particularly soft wool, spun to make it as wearable as possible even for those sensitive to wool yarns. The perfects shades for this pattern are Persian Red (2352) and Cloud Dancer (2350). King Cole Bamboo Cotton DK is a fabulous yarn choice for baby clothes. Bamboo yarns are famous for their non-allergic properties and Bamboo Cotton DK is deliciously smooth on the skin, thanks to its 50/50 mix of bamboo and cotton. We suggest knitting with shades Red (544) and Cream (538). NOTE: This yarn comes in 100g balls, so you’ll need half the amount stated in the table above. Get 10% off all these yarns by entering the code FESTIVEKAL at the checkout. Click the button below to find all the yarns. I will be knitting with Knit Pro Symfonie Single Point Needles 30cm for both needle sizes. Not only are they lovely to look at, they are lovely to knit with! Knitters around the world swear by these needles for their ease of use, comfort and unique look. If you prefer aluminium and are more interested in the price rather than the look of your needles, these Pony Single Point Aluminium 30cm needles are the ones you’ll want! These Addi Bamboo Single Point Knitting Needles 35cm are best for ‘slippy’ yarns and for those who put comfort first! They are flexible and kind to arthritic hands too. They also come in length 25cm, which you can find here. 4. Knit Pro Karbonz – Revolutionary option! The Knit Pro Karbonz Single Point Needles are one of the most revolutionary needles of our times that combine the premium quality of carbon fibre with perfectly shaped nickel plated brass tips. Carbon fibre is one of the most versatile material used in modern times for use in aircrafts and automobiles and is ideal for knitting needles on account of it’s high tensile strength, light weight and comes with a surface that offers excellent control over the stitches. So if you’re looking for something new and exciting to knit with – this is it! Get 10% off all these needles by entering the code FESTIVEKAL at the checkout. Click the button below to find all the needles. If you haven’t already got one, you’ll need a trusted cable needle for the front cabling. Try these Addi Cable Stitch Pins. I’m using these sweet and simple flat disc two-hole metal buttons for my cardigan to give it a bit of uniqueness. I’m hoping the finished result will be as great as I think it will! To keep with the festive red theme, why not try these lovely Fish Eye Buttons? Get 10% off buttons in the Christmas Knit-A-Long category by entering the code FESTIVEKAL at the checkout. Click the button below to see them all. You’ll also want to get to grips with whether the pattern will fit your little ones, so we’re revealing all the sizes available on the pattern in this handy table. Tension has significant effects on a knitted garment, so preparing a tension square/swatch before you begin is a great habit to get into. Click here to find out more about tension and how to make a tension square. Monica Russel is a knitwear designer and teacher with 30 years experience. Proud author of five pattern books, she enjoys exploring new yarns and creating new knitting patterns for two magazines and a publishing company. Monica created her company, The KnitKnacks, four years ago and runs knitting workshops for groups up and down the UK. Click here to find out more about the Knitknacks. Haven’t signed up yet? There’s still time! Simply enter your name and email address in the form below to receive alerts for when the next parts of the KAL go live! Join us next week on the blog when we’ll be revealing the first part of the pattern! If you have signed up, you will receive an email alerting you to when this post is available, otherwise keep an eye on our KAL blog section here, where the posts will be available weekly. Have any questions for me or Monica? Simply type them in the comment box below! What yarn will you be knitting with? Last updated: July 25th, 2017. I am planning on using Robin DK. That’s a lovely and soft choice, do let us know what it’s like to knit with when you start! That’s great, thanks for shopping with us. Are you excited to get started? Jenni, can’t wait, thanks for coordinating! I am making this for a boy so I am going to be using Sirdar Snuggly in a light Blue with a white snowflake. That’s a really lovely choice, the blue and white will look beautiful together! Make sure you upload photos throughout the KAL, I’d love to see how it looks. Change of choice yarn. There were not enough of the dye lot in the Sirdar Snuggly at my LYS so changing to Plymouth Dreambaby DK in light blue and white. Not a big change but never worked with this particular yarn before! Excited to get started! I ordered Monica’s choice, the King Cole Merino Blend. I purchased yarn to knit 2 sweaters. The first will be knitted during the KAL and will be the smallest size for a new baby girl due December 11th. The other will be a larger size for my nephew’s baby to wear next Christmas and who is due to be born May 10th. Lovely choice, I can assure you that it is so lovely and soft! Great idea to get it ready for next year when your nephew will arrive and I am sure the new baby girl will look gorgeous. Can’t wait to get started with you! I will substitute with cotton DK yarn for the HOT Aussie Christmas! I will also need to knit this one in short sleeves. Nice idea Pam! Please do share photos with us as I know there will be others will want to knit it for a warmer Christmas. Looking forward to getting going, aren’t you? I will sub with a cotton or linen DK yarn. I’ll probably knit in another color other than red and white. Lovely idea, we have a lovely Rowan linen DK, which comes in 100g balls (200m) You will need between 336m-448m depending on which size you are knitting so you would only need between 2-3 balls of the Shade A in which ever colour you choose. Here is the link: http://www.loveknitting.com/rowan-creative-linen. Do let us know which yarn you end up going for and what colours you choose! I’d love to see. 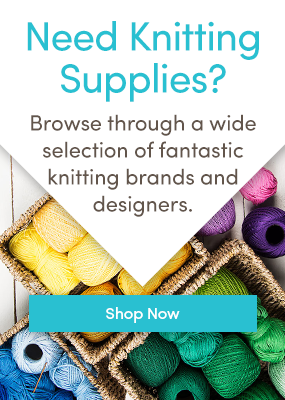 I just ordered Sirdar Snuggly DK and used the discount code. Fab Patty! Thank you for shopping with us. Can’t wait to get stared! Noah is a lucky boy!! I love the idea of knitting it in blue and white and if you’ve got plenty of yarn in your stash then why not use it! Make sure you share pictures as you go along. I’m looking forward to getting started with you to! I’ll be knitting the red and white king cole which I tool a gamble on in anticipation of the KAL – yes I’m that excited! Whilst I don’t actually need them…….I do like the look of the knitpicks symfonie needles – perhaps it’s time for a Christmas gift hint to hubby?!? Well done on guessing correctly and taking that gamble!! So glad to hear you are as excited as me, it will be great fun! Sometimes its more about wanting than needing… Just slip him the link I’m sure he’ll get the hint! Which size needles did you use for the tension swatch? Our first Grandson is due mid November. Can’t wait to get started on this for him. You will need the 4mm needles to make the tension swatch. Good luck! I’m sure your grandson will look just gorgeous in this little jumper for his first Christmas! Guess I did not read correctly at first. I need a 24 mo. Think I could change the gauge or yarn and make it a bit bigger? If you’d like to try knitting with a heavier yarn weight to size it up, you will need to swatch and then do some maths to work out which size to knit. If you’d like to stick with the same yarn its a matter of recalculating the placement of the snowflakes, garter stitch and cable bit. Possibly re-sizing the neck and then re-sizing the arm increases, so they are even and make a nice shape. It requires doing a bit of maths and a small garment is a good place to practice. Technically it’s called ‘grading’ and is a skill in itself, particularly when on a full size garment or one with lots of shaping or pattern. I hope this helps, but if you have any more questions just let me know! I am planning on using an aran weight wool and larger needles as I would need the sweater to fit a 4 yr old. looking forward to getting started. using yarn from my stash, then i will have an excuse to shop later!!!!! I’m using King Cole Bamboo cotton DK in red and cream. I’m doing a 6-12months and an 18-24 months for my youngest two grand daughters. The wool is on the way from loveknitting. Sounds perfect, your granddaughters will look adorable and I’m sure they will be loved by all in the family! Look forward to getting started with you! Lovely choice! The pattern is on it’s way and you can expect to get an e-mail this Thursday if you have signed up to receive our email alerts. Wendy Merino is a lovely choice, it is indeed suitable for those that are sensitive to wool. Nice idea! Look forward to starting with you! I’m going to be using Sirdar Country Style DK – powder blue and cream. Had this stashed and liked the idea of using blue as the main colour. Am going to knit the 0-3 months size for my daughters teddy bear. Powder blue and cream – what a lovely choice! I can’t wait to see how it knits up. 2) My niece will be 1 in January – so what age would be better for her? Wendy Merino DK is a great choice! You will need the 4mm needles to do your tension square. I would recommend you knit the 12 – 18 month size for your niece, as you know how quickly babies grow! However, it might be worth checking her measurements with the table above. If she’s on the small side then you might have to go for 6-12 months. I am using sublime extra fine merino, as it is for my first grandson. and he will only be 2 months old this Christmas. I think this will be perfect. Great choice! It will definitely be perfect for your 2 months old grandson, I can’t wait to get started, can you? My sweater will be knitted in Lion Brand Baby Soft Bluebell, and a “mystery” DK white from my stash. My swatches are finished, and I am waiting excitedly for the beginning of the pattern. The only Fair Isle knitting I have done before is a Christmas stocking and a baby hat; so, I’m really curious to see if I can do justice to these pretty snowflakes. Sounds like you are all ready and prepared to start the KAL! Not long now until we reveal the first part, I am more than sure that you will make some beautiful snowflakes. If you find yourself needing any help, just leave us a comment and we will help you out! I’ve purchased the King Cole Merino DK and am just waiting for delivery! My granddaughter is 13 months so I’ll be knitting the largest size. The pattern looks great; I’ve done some Fair Isle but only on clothes for toys, so I’m looking forward to a great challenge. Nice choice and well done for taking on the challenge! Please do let us know if you need any guidance and make sure to share your progress with us too. That sounds very festive, what a lovely thing to add to it. Please do share pictures with us as you go a long! We’d love to see how it works out. OK I’m ready, bought my supplies, got cotton yard in red and off white with a little sparkle in it. Hope it works. What level of experience would you suggest for this KAL? Good question, this KAL is for improver knitters – knitters who know the basics of knitting and want to give themselves a new challenge. Does this sound like you? We’d love to have you on board! Done my square, I am a loose knitter so have decided to use a size smaller needle is the OK? I love the Wendy Merino Wool, and have decided to invest in your lovely needles I have bamboo but think that maybe your choice is a cross between bamboo and steel. Needle size is only ever an estimate or average as suggested by the brand or designer and every knitter needs to find the right needle to match the tension stated in the pattern. If you find this has worked for you with previous projects then this should be fine. Lovely choice, they are actually wooden and knit very nicely. I think I am using from my stash, a winter sky blue that is a soft wool blend and a nice white. May change my mind if I see something better. This is my first knit along. I am excited. Nice idea! I do like the blue and white colourway. I’m excited to get started too, not long now! Make sure to share your progress with us. I have a 250g 12ply Filo Grande (Sean Sheep) red. Will that be ok? I still have to go buy the white. I’m not that familiar with the wool terms and grades. I’m used to the ply’s. You’ll need an 8 ply yarn, 12 ply is chunky and therefore it will be a lot bigger. This is handy if you’d like to size up but I’d advise not trying to match the tension. Also, 250g may not be enough as meters / yards will be less. I hope this helps, please do let me know if you’d like some more guidance! That helps. I have found some 8 ply that I have, so I am set and ready to go. I am also a loose knitter, which I discovered when I was knitting a jumper which ended up way to big. Ha ha ha Yes I unpicked the whole thing and started again. Still in progress. Just one thing, I don’t have the cable needle. Will I be able to work without it? Sorry to ask this but I am a self taught knitter and have only used knitting needles and circular needles. I will be buying my yarn on 18th of this month. I need some that is machine washable to 40 degrees centegrade. and preferably tumble dry. Does anyone have any recommendations. yarn must be soft and nice to work with. I have never knitted a sweater, am self taught!,have made hats, scarves, lace shawls can I do this? Of course you can! We’ll be with you every step of the way with tutorials and tips and if you need any extra guidance, you can simply ask your questions in the comment boxes and we will try our very best to help you. I’m ready to begin but where do you find the pattern? I am using a yarn from my stash. How many yards do I need? Sometimes grams doesn’t give me enough yardage. If you are knitting for ages 0-3 or 3-6 months, you will need 367 yards of the Shade A (red) yarn or if you are knitting for the bigger ages 6-12 or 12-18 months, you will need 490 yards of Shade A (red). Hope this helps! Can’t wait to get started on the pattern. I will be using the King Cole yarn and making it for my new little grand daughter, she is just over 2 months old! Anxiously awaiting my order with my yarn and I will be making the 3 – 6 month size. Let’s get this party started!! Yippee!! I’m using King Cole Bamboo Cotton as my baby grandson has sensitive skin. Can’t wait for my yarn and needles to arrive so I can do a tension square. Really looking forward to starting the project! Lovely choice, it should be ideal for your grandson if he has sensitive skin. Looking forward to starting too, not long now! I am afraid my granddaughter would be allergic to wool as her father is. But I got A Bernat sheepish by Vickie howell which I had on hand for something else that is red and a white of the same yarn so I think I will use that. I do have a question though. What type of needles are reallybest to use for knitting in general. I have been using the Clover Bamboo premium knitting needles. I know some use the metal ones that can be swapped from one size to another it is like a kit. However, I have used the regular metal knitting needles I guess by bates but I don’t like the noise it makes (the clicking sound). So I have been using the Bamboo ones. Is there something better than the bamboo ones??? Just curious. I would say that the knitting needles you choose is certainly a personal choice. Some needles and yarns go better together, e.g. cottons, linens and silks with wood or bamboo and hairy yarns with wood or metal. But some tight knitters don’t like wood as they bend too easily. The tips make a difference too with blunter needles better for a loose twist, sharp points are ideal for lace etc. The best advice I can give is try a variety, borrow some from a friend or knitting group and have a go! I am using some red wool recently purchased from my local wool shop, and white with a slight sparkle in it for the snow flakes. My grandson will be 6 months at Christmas and will love it. I already have Hayfield Bonus DK in white in my stash so am thinking of getting the same in red, especially as I am a first time fairisle knitter and not sure if I will cope with it. Hayfield Bonus DK is a nice choice if you feel you need to give it a trial. It comes in larger balls of 100g with a yardage of 280m (306yds), so you’ll only need 2 balls of the red for any of the sizes.I love this classic red colour: http://www.loveknitting.com/hayfield-bonus-dk?sku=yhf002_833. As for whether you will cope, remember that we will be here to answer any questions and guide you in anyway we can. We will also have extra tutorials for the fairisle. When will you be sending pattern details? I’m keen to get started. Such a lovely pattern. Not long now! We will be revealing the first part of the pattern this Thursday, 6th November. We wanted to make sure that our lovely customers from further across the pond could get their yarn in time. Thank you, I am so looking forward to getting started too! Hi I’m knitting with Robin Double Knit shade 064, which is a lovely medium/dark pink and Sirdar Snuggly in white. I’ve only started knitting about 3yrs ago and taught myself. I’ve never done any thing like this before I am still learning to read the patterns lol. I hope I can do this lovely pattern justice. That’s a nice choice! Well done on teaching yourself knitting, this will be a great chance to learn new skills and get answer questions you have answered. I am positive you will do this pattern every bit of justice!! I just received my Wendy yarn! I’m ready! Only one day to go! Yippee! I won’t be able to join you ladies and I am so sorry. They diagnosed with Polymyositis and I have to be in physical therapy everyday for a while. Thank you for inviting me but I just can’t join at this time. Maybe if you ever have another one I will be able to join you. I’m very sorry to hear this and I hope the physical therapy helps you so you can get back to some light knitting soon. You can still be a part of it by reading all our tutorials and advice, which will help for future knitting! We will certainly be having more KAL’s in the future, which you will be more than welcome to join, so do keep an eye out. I’m just waiting on my Sublime yarn. Maybe it will be here tomorrow! Can’t wait to get started! I’m learning to knit, is this for beginners? This project is great for improver knitters, who know the basics of knitting and would like to take on a new challenge. If this sounds like you then it is a perfect KAL because you will receive tutorials and guidance every step of the way. If you have any questions, you can also comment as you have done here and we’ll try our best to help you. I’ll be using some yarn from my stash. I had the colors on hand red/white and I believe it’s cotton/bamboo blend. I will be doing the 6-12 month for a little girl I used to babysit before they moved to very cold state. Just received my wool from love knitting! What fast, wonderful service! So excited to start this KAL! Hi – I’m new to this site but was inspired to join the KAL to celebrate the birth of our new granddaughter who was born in October – and to brush up on my knitting skills. I was under the impression that the first part of the knitting pattern would be available today. Could you please tell me where I will find it. I am using Sirdar Snuggly DK in Engine Red & White. I love this yarn and have been using it for at least 20 years for all my baby garments. I have 2 new babies in my family that will look precious in this sweater set. Can’t wait to get started. Is the first part of the pattern being releSed today? I didn’t get the email for Part 1. How can I get that? 3(3:4:4) means how many balls of the red yarn you need, according to the size you are knitting, so if you are knitting sizes 0-3 months and 3-6 months you need 3 balls of red, if you are knitting sizes 6-12 months and 12-18 months you’ll need 4. It seems the 3.5mm are sold out, knitting with smaller size needles may make the sizing a little bit smaller, so you’ll need to make sure to account for that. Unfortunately, I really don’t have a baby/toddler to knit this for … and I’m in the middle of knitting 2 sweaters for Christmas! I’d love to do this, but it’s going to have to wait!